How to review a game like StarCraft II: Legacy of the Void? Where do you even start? Do you try to figure out how it fits into today’s landscape of competitive multiplayer games? Do you ask whether it makes for a worthy conclusion to the story that began nearly 17 years ago? Do you just say whether or not it’s fun? I have been playing StarCraft II, on and off, since March 5, 2010. For five years, it’s been one of my go-to multiplayer games, something I’ve always kept installed on my laptop so I could squeeze in a quick match before bed. I’ve pulled off clutch victories, gone on brutal losing streaks, and cursed myself for still getting supply-blocked five minutes into a game. I’ve watched dozens of Day9 Dailies, played hundreds of online matches, and observed as the internet declared that StarCraft II is dead, murdered by the MOBAs that had spawned from its predecessor. At one point I made it to Diamond League, although I’m still not sure how. So let’s take a stab at answering all three of those questions. With Legacy of the Void, StarCraft II multiplayer is in a better place than it’s ever been. Competitive matches are faster and more interesting. The new co-op mode is an unexpected delight. There appear to be balance issues—Liberators are hard to stop, aren’t they?—but this is a living game that will be patched and updated for years to come. Amid all of these new ideas and changes, it remains clear that Blizzard is not afraid to experiment. There aren’t nearly as many positive things to say about the story, which revolves around the stuffy Protoss and their leader, Artanis, as he tries to figure out how to defeat a big void grump named Amon. At this point, as had been hinted in the last two games, StarCraft’s story has morphed from “war between nuanced characters with their own motives and feelings” to “good heroes vs. evil demons,” which is a real shame. Amon is bad news, everyone wants to beat him, and that’s all you really need to know. The lowlight of this whole shebang is the epilogue, a set of three missions that caps off the story of Raynor and Kerrigan in a way that is undeniably conclusive yet truly terrible, marred by cheeseball dialogue and a corny deus ex machina. But, hey. If you expected subtlety, you must have missed the first two games. That third question—Is it fun?—is of course a harder one to answer. The short answer, though, is yes. Yes, Legacy of the Void is fun. If you have been living in a supply depot for the past 20 years and have never heard of StarCraft, here’s a brief explanation: This is a real-time strategy game, with a top-down perspective and three distinct factions: the humanoid Terrans, the swarming Zerg, and the psionic Protoss. You the player, serving as an invisible commander, must manage resources, research technology, and build an army to overcome obstacles and conquer either AI or human opponents. At its best, StarCraft is a massive, intricate game of chess that tests both your situational decision-making and your finger speed. The learning curve is significant—if you don’t know that the counter to roaches is immortals, or that a starport with a tech lab in your opponent’s base means that banshees are coming, you’re probably not going to make it very far in competitive play. Because of that learning curve, StarCraft II has developed a reputation as the most challenging and least accessible of eSports, which is likely why Blizzard’s streamlined things for Legacy of the Void. For starters, they’ve simplified most of the game’s complicated “macro” mechanics: Whereas before you had to juggle the Protoss’s Chrono Boost every few seconds to give temporary speed buffs to your buildings, for example, now you only have to tag a building once to keep the effect going. Opening worker counts have been doubled from six to 12, which cuts some extra downtime from the beginnings of matches. Many of the new maps offer more defensible expansion points, too, which allows for a wider variety of opening gambits. (It also allows for plenty of trick plays—just last night I played against a Protoss player who tried sneaking into my expansion for a good ol’ fashioned cannon rush.) The upshot of all these tweaks is that competitive matches are now both faster and more accessible, although the difficulty level is still up there. 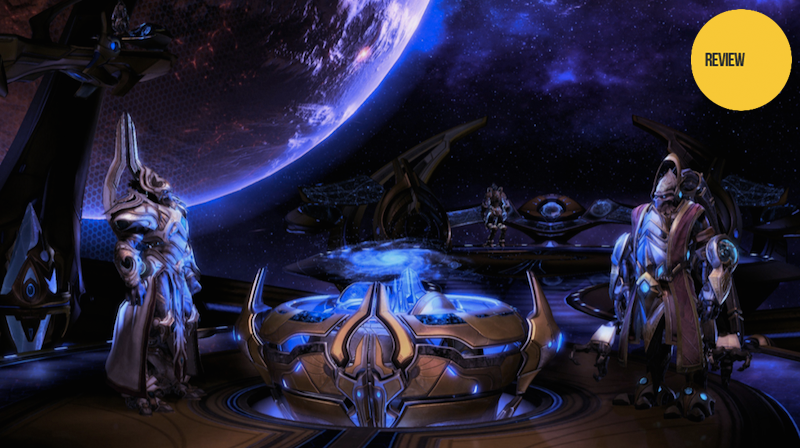 Legacy of the Void is the third and final game in the StarCraft II trilogy, following the Terran-focused Wings of Liberty (2010) and the Zerg-helmed Heart of the Swarm (2013). Like its predecessors, Legacy adds new units both to single- and multi-player. Also like its predecessors, Legacy’s story is unabashedly cheesy, full of prophecies and MacGuffins and dialogue straight out of a saturday morning cartoon. While StarCraft and Brood War told stories of people struggling against one another, StarCraft II tells a story of people struggling against pure evil, which is not nearly as interesting. There is no nuance here, just a Big Bad who must be defeated with the power of teamwork and plot contrivances. Some of the dialogue can be fun—”You think us fools?” “Yes, but that is irrelevant.”—but for the most part, Legacy of the Void is as dry as the alien race it stars. There’s the requisite maelstrom of meaningless proper nouns like Cybros and Tal’darim. Artanis, your hero, is noble yet flat, lacking Raynor’s grittiness or Kerrigan’s mean streak. His companions are forgettable, and his quest to defeat Amon has is never emotionally engaging, despite the fact that it concerns the fate of all life in the universe. Nevermind the Raynor/Kerrigan love story, which is shelved for most of the campaign and then brought back for the epilogue, where it lands with a resounding thud. It’s all generally boring and unconvincing, a far cry from some of Blizzard’s other stories. Lame plot notwithstanding, the single-player campaign is excellent. The missions are designed well, with enough gimmicks to keep things fresh even when you’re sick of building Protoss Death Balls. One mission, for example, limits your starting resources and tasks you with maneuvering your base around the map by way of mobile space platform. Other missions give you heroes with MOBA-like special abilities—my favorite, Karax the Phasesmith, can take control of any enemy robot in sight. There are still plenty of opportunities to build up an army and clear out a bunch of Zerg hives, but most of the time there’s a mechanical twist or two to keep you on your toes. As always, the campaign feels like a footnote to StarCraft II’s multiplayer, which has now expanded thanks to two huge new modes, Archon and Allied Commanders. In Archon mode, two players can take control of the same army, teaming up to build up resources and guide units around the map. It’s a smart way to let people play competitively with less pressure; StarCraft is way less overwhelming when you’re working with someone else. Allied Commanders is even more interesting—it lets two people, each playing as an army controlled by specific heroes like Raynor or Kerrigan, team up to overcome specific co-op challenges like “defend this temple” or “go blow up all these trains.” Beating challenges will get you experience points to level up the hero you’re controlling, which can unlock new abilities and army units, which will let you play more Allied Commander challenges on higher difficulty modes. It’s a gratifying loop that makes for a fun diversion to standard multiplayer. So, how best to review Legacy of the Void? Turns out that answering those three questions is a good way to go. Legacy of the Void may not propel competitive StarCraft back to the heights it reached in the pre-MOBA mid-aughts, but it adds a number of interesting twists to the game’s already strong competitive formula. The story is generally bad, and the epilogue in particular is a bummer, but as in the past, the game itself is fun enough that it doesn’t really matter. And it is indeed fun—very much so. Blizzard’s ambition is written all over Legacy of the Void; it seems clear that the studio hopes the expansion will remind the world that StarCraft II isn’t just alive, it’s better than it’s ever been. Given the many improvements and sharp new ideas this concluding chapter brings to a nearly two-decade-old series, it’s hard to argue that isn’t the case.